At the invitation of President Vladimir Putin of the Russian Federation, and President Frank-Walter Steinmeier and Chancellor Angela Merkel of the Federal Republic of Germany, President Xi Jinping will pay state visits to the two countries from July 3 to 6. At the invitation of German Chancellor Angela Merkel, President Xi Jinping will attend the 12th G20 Summit in Hamburg on July 7 and 8. This Thursday at 9 a.m., officials from the Ministry of Foreign Affairs, the Ministry of Finance and the Ministry of Commerce will hold a press briefing on President Xi Jinping's state visits to Russia and Germany and attendance at the 12th G20 Summit in Hamburg. We welcome your attendance. Q: The US State Department will unveil later today the annual Trafficking in Persons Report, rating China among countries of the worst record when it comes to human trafficking. What is your response to this? A: This is not a new question, and the Chinese government's position on that is clear to all, that is, we are resolute in combating human trafficking. The progress that we have made is also obvious. We are firmly opposed to the irresponsible remarks made by the US based on its domestic law about others' efforts against human trafficking. The Chinese side always believes that no country can stay aloof from the fight against human trafficking as it is a crime plaguing the whole world. The Chinese side will step up cooperation with other countries to crack down on human trafficking based on mutual respect. Q: According to the Yonhap News Agency, the ROK's Unification Ministry has approved the Eugene Bell Foundation Korea's application to send medication for tuberculosis and materials to build hospital wards to the DPRK. The shipment will be transported to the DPRK's western port city of Nampo via China in July. The report said that it marked the first approval by the new Seoul government for a shipment to the DPRK. What is your comment on that? A: We have noted the report. If that is true, then it is a piece of good news. People of the DPRK and the ROK are from the same nationality. Improvement of the bilateral relationship and progress in reconciliation and cooperation serve the fundamental interests of the two sides and contribute to regional peace and development. The Chinese side is ready to provide necessary support. We hope that the DPRK and the ROK will, under the current circumstances in particular, continue to show each other their goodwill, and play a positive role in lowering the tension on the Korean Peninsula and restarting dialogue and consultation. Q: You just said that President Xi Jinping is going to visit Russia. Does the visit start on July 3? How long will it last? What topics will be discussed by the two sides? Can you give us more details and tell us China's expectation for the visit? A: As comprehensive strategic partners of coordination, China and Russia have seen their relationship developing at a high level and at its best. As I just said, at the invitation of President Putin, President Xi Jinping will kick off his state visit to Russia on July 3, during which he will hold talks with President Putin and meet with other Russian leaders for an exchange of views on how to deepen the comprehensive strategic partnership of coordination and elevate bilateral cooperation. The two sides will also discuss hotspot issues of common concern. As for the schedule of the visit, we will make it public in due course. A press briefing on the visit will be held here on Thursday morning, during which you will be given more details and your questions will be taken. Q: China and Japan have agreed to hold the seventh high-level consultation on maritime affairs in the first half of this year. Can you tell us the date, venue and topics of the consultation? A: It was decided at the sixth China-Japan high-level consultation on maritime affairs that the seventh consultation will be held in the first half of this year. As agreed by the two sides, the consultation will take place in Fukuoka, Japan on June 29 and 30. Officials from departments of foreign affairs, defence, maritime law enforcement and management of the two sides will attend the consultation. The high-level consultation mechanism is a comprehensive communication and coordination mechanism between the two countries for maritime affairs. The Chinese side expects to exchange in-depth views with the Japanese side on maritime issues at the consultation with the aim of nurturing greater mutual understanding and trust. Q: The Ghanaian government said yesterday that, following a visit by the Vice President of Ghana to China, China will offer more loans to Ghana. Can you confirm that? A: Ghana is a traditional friend and an important cooperative partner of China in Africa. Last week, Vice President Mahamudu Bawumia of Ghana paid a successful visit to China, having productive talks and meetings with Chinese leaders. The two sides agreed to deepen friendly and mutually beneficial cooperation in investment, financing, infrastructure, energy, mining, agriculture and other fields and encourage companies and financial institutions of the two sides to enhance mutually beneficial cooperation. China will work with Ghana to implement the "ten cooperation plans", and push ahead with mutually beneficial cooperation for tangible benefits. Q: Authorities in the Somalian region of Puntland say there has been an explosion aboard what they believe was a foreign ship off the Puntland coast. We don't know which country it is, but is there any information suggesting it might be a Chinese ship? A: I hope and pray that it is not a Chinese ship. But no matter which country this ship belongs to, what has happened is a tragedy. I have just heard about that, and my colleagues are checking on that. I have no details to offer at the moment. Q: Following the changing of the name of Taiwan's trade office in Dubai, its trade mission in Ecuador has recently changed its name from "the Commercial Office of the Republic of China (Taiwan)" to "the Commercial Office of Taipei". Taiwan said that China exerted pressure on several countries who are not Taiwan's allies to have the names of Taiwan's representative offices changed. How do you respond to that? A: The Chinese government highly commends the Ecuadorian government for dealing with Taiwan-related issues in line with the one-China principle. What it proves once and again is that upholding the one-China principle has become a shared view and an irreversible trend of the international community. It has nothing to do with the Chinese government putting pressure on others. 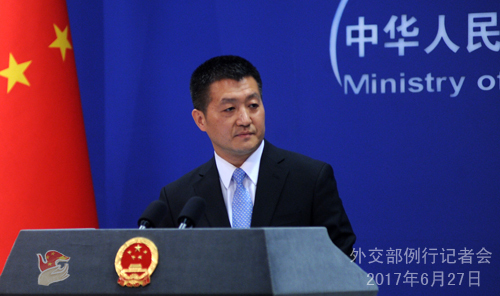 Q: According to the Foreign Ministry's statement yesterday, some Indian border guards crossed into the Chinese territory at the Sikkim section of the China-India boundary. Has the Indian side taken any steps to remove China's concern? What is the latest on this issue? A: Yesterday, spokespersons of both the Defence Ministry and the Foreign Ministry of China have made statement on Indian border troops' trespass and provoking of troubles at the Sikkim section of the China-India boundary. 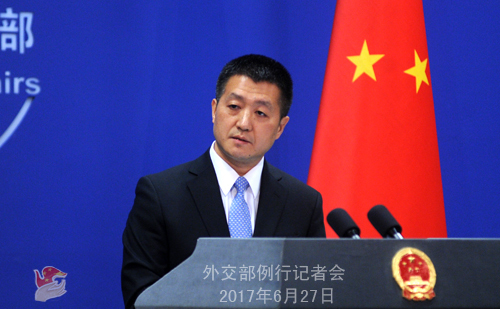 It is the Indian border troops who crossed into the Chinese territory and obstructed the Chinese border troops' normal activities in Doklam. We have taken proportionate measures in response. As for the question you asked, the Chinese side has lodged representations with the Indian side both in Beijing and Delhi, expressing our solemn position. I must say that China is sincere about developing friendly relations with India but is also resolute in safeguarding its own sovereignty and interests. We hope that the Indian side will work with us, take swift and correct measures to bring those who crossed into China back to the Indian side of the boundary. Q: The Foreign Ministry statement said that the situation on the boundary was the reason why the arrangements for Indian pilgrims were being delayed. I just want to ask what about the remaining 300 pilgrims who are supposed to be undertaking this very important pilgrimage in the next few weeks, will China make arrangements for them or will they be denied? 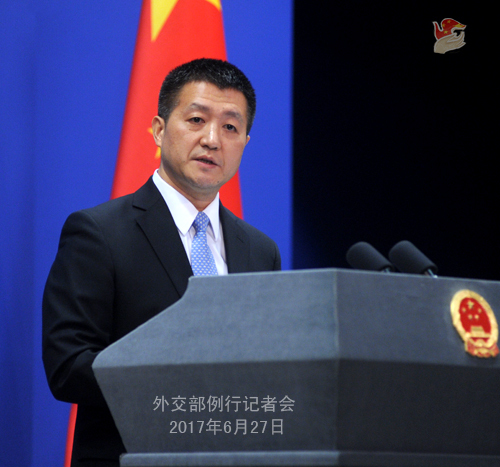 A: I have stated China's solemn position and requirement concerning the Indian border troops' illegal entry into China. I will not repeat it. As for the trip by Indian officially-organized pilgrims to Xi Zang via the Nathu-la mountain pass in the Sikkim section of the China-India boundary, I believe that the Indian public are fully aware of the enormous efforts made and the convenience provided by the Chinese government against all odds in the interests of China-India friendly relations. Recently, the Indian border troops crossed into the Chinese territory at the Sikkim section of the China-India boundary, and in response to that, we have taken necessary and emergency measures. In the meantime, we have to put off arranging for Indian officially-organized pilgrims' entry into Xi Zang via the Nathu-la pass out of security concerns. We have informed the Indian government through the diplomatic channel. As for what is coming next, it is a matter of course that the Indian side should take necessary measures to alleviate the tension caused by their border troops' illegal entry, and create conditions for their pilgrims' travel to Xi Zang via the Nathu-la pass. Q: The next round of Syria talks will be held in Astana on July 4 to 5. I wonder if the Chinese special envoy on Syria or any official from the Foreign Ministry will attend the talks? A: It is China's long-standing position that the Syria issue can only be resolved through political and diplomatic means. We believe that both the Astana talks which focus on realizing ceasefire and cessation of violence and the Geneva talks which aim at promoting political settlement are positive efforts for peaceful settlement. The situation in Syria is at a crucial juncture where all relevant parties should bear in mind the overall peace and stability of the region, work for the shared goal, and jointly play a constructive role for the political settlement of the Syria issue. As for the particular question you asked, the Chinese side always supports the process of political settlement. We hope positive outcomes can be achieved in the Astana talks on July 4. 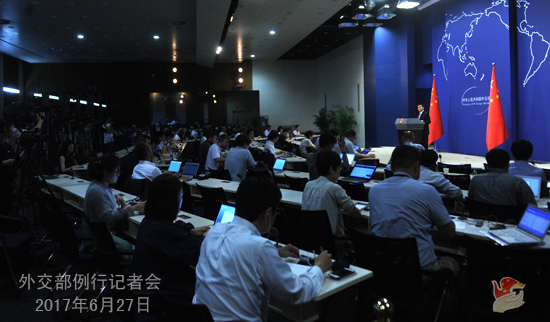 Information about China's attendance will be released in due course. After the press conference, a journalist asked: Since China believes that the Sikkim section of the China-India boundary has been defined, can you tell us how it was defined, based on which treaty, when it was confirmed by the Indian government and how? A: There is solid legal evidence to support the delimitation of the Sikkim section of the China-India boundary. It is stated in article one of the Convention Between Great Britain and China Relating to Sikkim and Tibet (1890) that "the boundary of Sikkim and Tibet shall be the crest of the mountain range separating the waters flowing into the Sikkim Teesta and its affluents from the waters flowing into the Tibetan Mochu and northwards into other rivers of Tibet. The line commences at Mount Gipmochi on the Bhutan frontier, and follows the above-mentioned water-parting to the point where it meets Nipal territory." It is without any doubt that the spot where the Indian border troops trespassed is on the Chinese side of the boundary. Both China and the successive Indian governments recognize that the Sikkim section has been delimited. It has been confirmed by the Indian leader, the relevant Indian government document and the Indian delegation at the special representatives' meeting with China on the boundary question that India and China share common view on the 1890 convention's stipulation on the boundary alignment at the Sikkim section. To observe the relevant convention and document is the inescapable international obligation of the Indian side.